Craig and Heather have been serving in the Amazon region of Peru since 1989, working under a cooperative agreement between Mission to the World and South American Mission. Craig is a missionary bush pilot, transporting missionaries to remote parts of the jungle where there are no roads. A typical one-hour flight can save a missionary two weeks of traveling by canoe and foot. South American Mission’s aviation program is called SAMAIR, and in addition to his flying responsibilities, Craig also serves as the SAMAIR program director, and is a member of the SAM Field Leadership Team. As if flying into short dirt strips isn’t “exciting” enough, the Lord has brought an equally exciting work into being through the family’s hobby of motorcycle racing. Several years ago, a small Bible study began which grew out of relationships built through Craig and daughter Whitney’s interest in racing motocross. It has now grown to a church of almost 300 members – thanks to God’s provision of a gifted Peruvian pastor, who is also a former professional motocross champion! 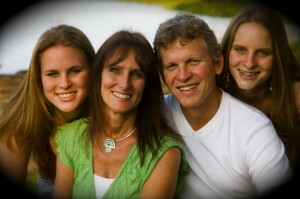 Craig serves as an elder in the church, and he and Heather lead small groups. They have two children, Whitney and Kara.